Location: Aronia Beach hotel is located in the southern part of Sunny Beach, on the first line next to the sand dunes of one of the most beautiful beaches along the southern Black Sea coast. 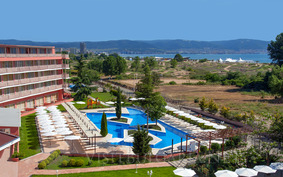 Accommodation: The four-star hotel offers 229 standard and family rooms. The rooms are spacious, modern furnished with comfortable furniture, air conditioning, cable TV, mini bar/ fridge, telephone, bathroom with hairdryer, desk, terrace.